Check out the healthy recipes from fellow state employees! 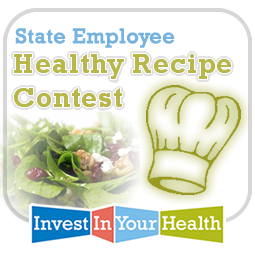 Please look over our recipes submitted by state employees in our healthy recipe contest during September’s Health and Wellness Month. Use of any information on this website is “at your own risk”. Recipes are listed here merely to aid your own research and decision-making. You must make up your own mind as to the value and appropriateness of each recipe. Take care to determine any possible medical condition (e.g., allergies) that may arise from the consumption of each ingredient. The State of Indiana, the State Personnel Department, State officers and employees (hereinafter “We”) are not responsible for your decision to use these recipes. We are not medical professionals or nutritionists. Consult your personal medical provider or dietician. We are not responsible for the outcome of any recipe you try. We assume no obligation or liability with respect to these recipes and make no warranties, express or implied, including, but not limited to, the warranties of fitness for a particular purpose or non-infringement. We are not responsible for any domestic accidents that could result from preparation of the recipes or for any kind of food borne disease. Use your best judgment when cooking with raw ingredients such as eggs, meat, chicken or fish. An adult should supervise children in the kitchen. We assume no responsibility for any typos or other defects in any of the information provided. No infringement of any text or graphic copyright is intended. If you own the copyright to anything appearing on this website, please contact the Webmaster so that proper credit can be given; or if you wish, it will be removed from the site ASAP. We do not hold any copyright or trademark. We do not claim ownership of any copy cat (restaurant or product clone) recipe inadvertently listed on the website.